Home » Crafts, Sewing, & Home Decor » Family » Great News! That title should give it away…..right? Yes, it’s true, no one is pregnant forever. And oh, it feels so good. Our newest little kissable edition joined us on March 2nd, at 6:46 p.m. The moment my water broke, the doctor gasped as she told the nurses to step back. She laughed as she announced that she had never seen that much water after breaking the water. And then again as our sweet little baby was born, another batch of waters came flooding out………and the doctor again exclaimed that this baby had so much padding around her. Wow. I laughed out loud at this point, remembering that I had just shared with you all the day before that my babies are swimming in resort style comfort. That was obviously no joke. Okay, enough chatter. I can’t wait to share this little lady with you. She’s my reason for being absent for most of the week. And completely worth it. Ahhhhh….she’s out. And it was finally my turn to hold her after the nurses cleaned her up. And her daddy couldn’t get enough of her either. 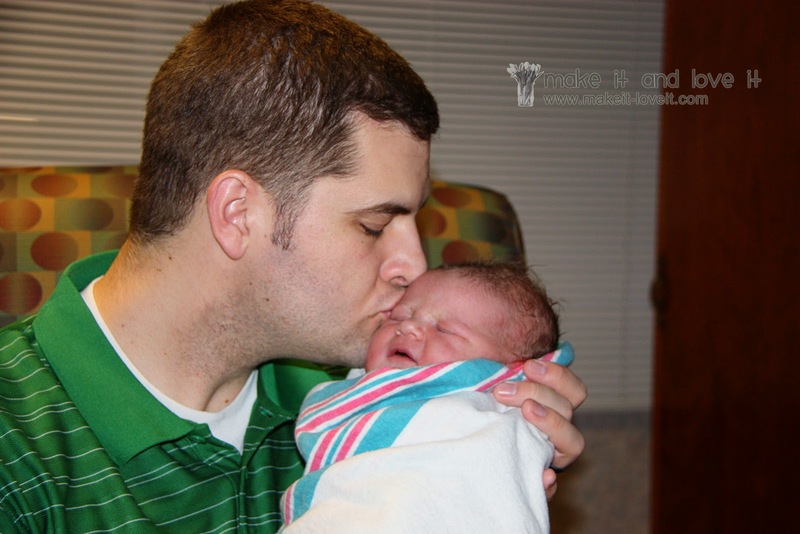 For some reason…….looking at a newborn is completely irresistible. And this baby gave me 11 whole pounds to love on. The next day, both kiddos were so excited to get their hands on her. 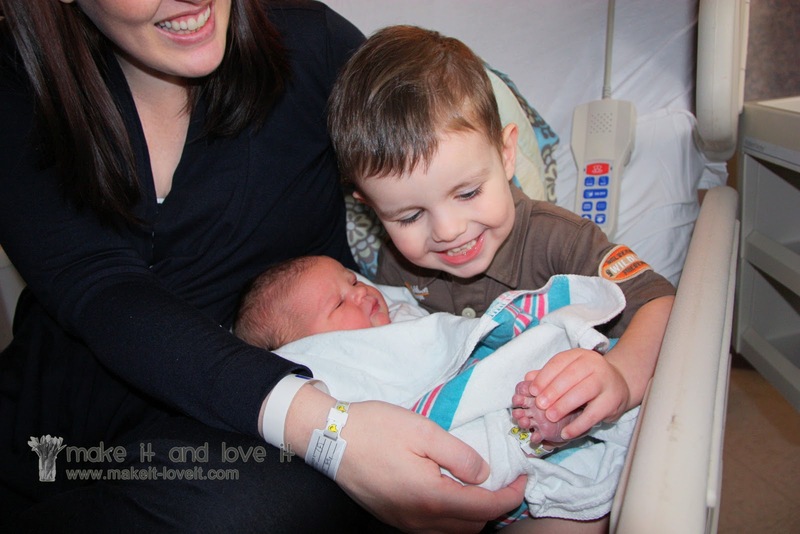 They were so giggly…….and thrilled to meet their baby sister. Yes buddy, she even has toes. Yep, just like you. And this little lady felt like she was given a brand new baby doll to hold. Only this one moves and makes noises. We’re home now and doing well. And are enjoying some incredibly yummy cheeks. Thanks for all of the comments and well wishes from the last post. (They really gave me a boost. I even read some while laboring with my epidural in. Ha.) And also for hanging around to see how everything turned out. It’s been fun sharing the details……..and I’m sure there will be more chubby-cheek (and non craft related) pictures in the near future. So thanks for humoring me. 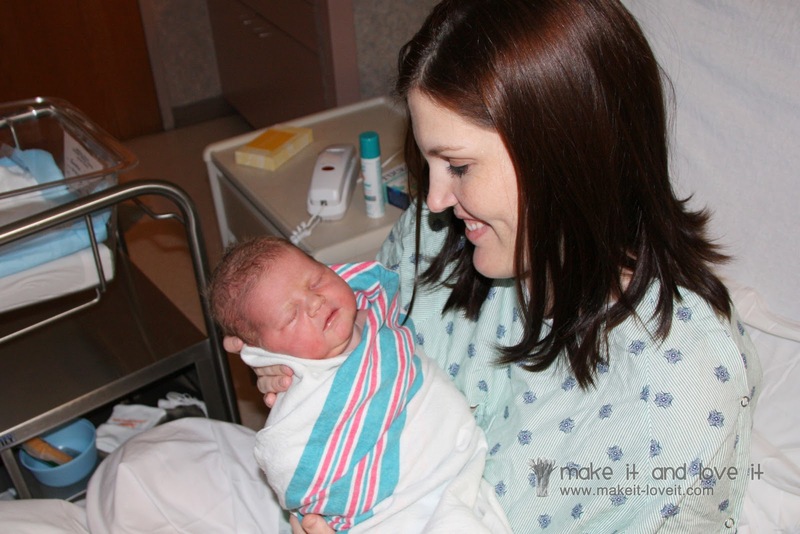 She's beautiful and you look way too gorgeous to have just given birth! Please tell me you fixed up before that picture was taken! yay!!! I knew it! I was thinking the other day that she had to be on her way and when you didn't post yesterday I knew it had to be true. :) CONGRATS, she is perfect! Looking forward to updates. She is precious. I just wanna kiss those chunky checks…Congratulations. P.s. I HEART your blog! You made it… You love it! Congratulations! Are you sharing her name? She is delicious! Congratulations! I can't believe you were able to deliver an 11 pounder without a c-section. You rock! Congrats, Congrats! I've been thinking about you. (and I don't even know you. haha) I'm so glad everyone is well and healthy!! Congratulations on your newest one! I absolutely love the sparkle in Grandma's eyes!! You can sure tell it took her back! She's glowing! What a beautiful girl!! COngratulations. I love to be in on all this lovely part of giving birth I have 3 months to go…. And not fair that you look so good in your pictures!! Congrats! She is adorable! I love that last photo of her. I love those cheeks. Your mom looks just the same as she did when we were in High School! Glad you and baby are doing well! That is one cute baby! 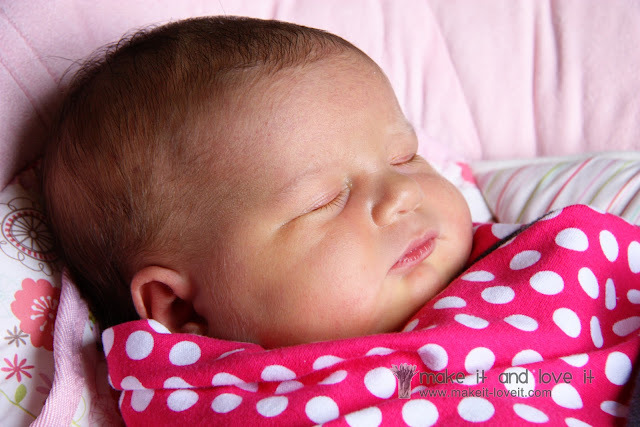 The good thing about big babies is they seem to skip the pruney newborn stage and go straight to adorable! 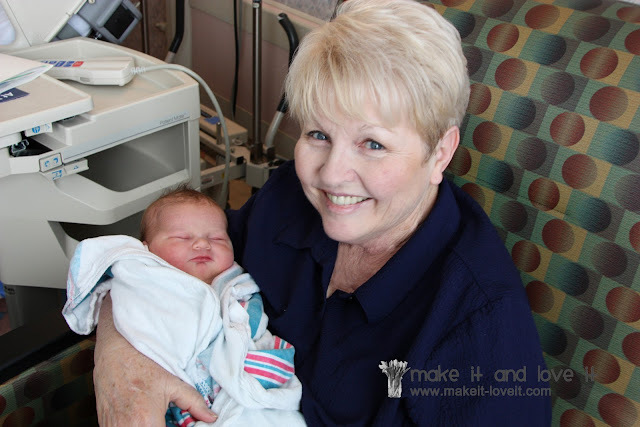 I was 9 lbs 15 oz—my mom's smallest baby and the only one she had an epidural with. This IS great news! You look absolutely radiant and she's perfect! Glad the labor was the easiest yet and thank you for sharing these delightful pictures. She's beautiful! And you look absolutely gorgeous! So glad she's here! ELEVEN pounds!! You deserve a medal! She's gorgeous! Aww my daughter was born on March 2nd also. She just celebrated her 4th birthday. Congratualtions!! She's beautiful!! I love those cheeks. Congratulations! She is beautiful and bigger than my two put together! My daughter was 3lb 4oz and my son was 4lb 10oz. Quite a difference! Wonderful, beautiful gift from God! Thanks for sharing those pictures. Love the one of your little boy admiring those toesies. Brought tears to my eyes! AWESOME!!! My TWINS weighed 11 pounds combined! WAY to go! Congrats! Oh ~ Congratulations!!! She is just a doll! and the smile's on teh kids faces? priceless!! Congratulations!!! She is simply adorable. Oh those cheeks are just begging for kisses aren't they?? She is truly beautiful!!! Congrats!! I love squishy cheeks!!! She is beautiful. I had extra fluid for my son to swim in. Fortunately for me, that caused my waters to break two weeks early. Congrats to you! How yummalicious are those cheeks?!? As I look at newborns I always think "Oh the adventures that await you!" She will be blessed to have you along for her adventures! Oooh – so squishable!!! My baby boy (now 8 weeks exactly) is just now 10lbs 3oz, growing more handsome every day. Big IS beautiful – congratulations!!! She is so beautiful. I just want to kiss her cheeks. BTW you look fabulous in your pictures. I never look that good after having a baby. Congrats!! 11 pounds in just a couple hours of pushing! Wow you're my new hero! Glad you're all home safe! She's a doll! Congratulations! She is beautiful. What is her name???? Congrats and yowza! My babies were so tiny. But at least they had chubby cheeks to kiss on! Glad you are all doing well!!! She's lovely! congratulations! what great pictures-she's beautiful! so glad all went well and hope you can get some rest! Holy Buckets! 11 pounds. But what a beautiful baby. Congratulations! Congratulations! She is absolutely beautiful! Congrats!!! Those cheeks are too cute! Beautiful family. Congrats! Nothing like a new baby! What a beautiful family!!! You look so happy :) Congratulations on your gorgeous new baby! All of your kids are so cute and the hospital pictures are just dear. I thought my 10 lb baby was big! Congratulations!!! So glad that everything went so smoothly for you and that it was your easiest delivery!! Hope you have a quick and easy recovery! She is a beauty!! Oh Ashely she is beautiful! Bad news though….now I want another one!!! Congratulations! She is gorgeous! She does favor your baby picture. All of your children are adorable. What a wonderful family! Oh, I could totally look at those beautiful, chubby cheeks and non-craft related posts for a long time! Completely agree that newborns are so irresistible. Your pics even make me want to have another baby. Right now. And mine is only seven months old!! And you look amazing. Congratulations! I'm glad she's here and everyone is doing well! I'm so happy for you and your family! Babies are SO much fun and grow up way too fast! She is beautiful. SO BEAUTIFUL!!! I thought my 9.5 lb baby boy was big. Ha!!! Congratulations!!! I knew it! I knew when there was no post yesterday that there was something exciting going on! And I have to just cross my legs at the thought of an 11lb baby. Luckily those 11lbs make some truly kissable, chubby cheeks. 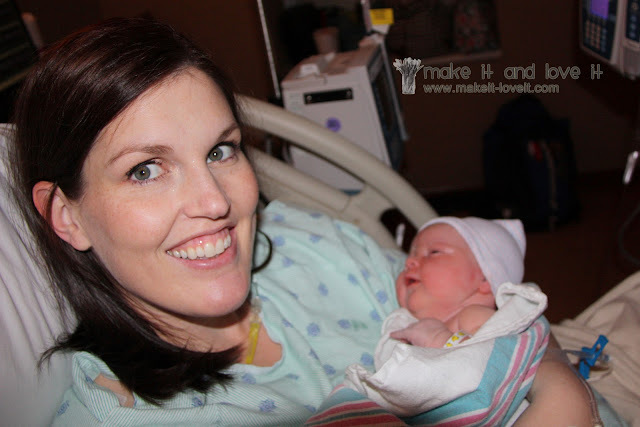 Congratulations–she is adorable and you look fantastic after birthing an 11 pound baby! Absolutely precious! I'd love to kiss on those cheeks!!! Big babies are the best! Ah those cheeks are irresistible! She's a beautiful girl and you look incredible! Congratulations! what a chunk!! big congrats!! Oh my goodness… 11 pounds of chubbalicious perfection! I could sniggle her up all day long. She's an angel. Congratulation and kiss all those baby toes for me. Congratulations! She is BEAUTIFUL! A perfect size too–almost exactly the same size as my first born except my daughter was 22.25 inches long. Other than that, the same size! It is so neat to see other newborns who are a similar size to my own–makes my memories come flooding back! Awww – so very sweet!!! Congratulations!! Oh my goodness, those chubby cheeks! I kept checking back to see if she was here yet since you had been absent from here for a few days! Congratulations to you all!! CONGRATULATIONS! Those cheeks are fabulous! Oh she is so beautiful just like her momma! I love those cheeks! Congratulations! She is so adorable and beautiful. Congratulations!!! Thanks for sharing! I am a new follower of your blog and am expecting my precious baby boy to arrive any day now too! This post makes me so excited. Congratulations! Aww! congratulations on your bundle of joy. She's Oh soooo! pretty. Yeah! Congrats! She is so super sweet! She is absolutely BEAUTIFUL! Congrats! Congratulations! She is absolutely precious. And you look fabulous even in a hospital gown! Sooo happy for you! You are beautiful! And your mom…pretty lady! Glad everything went well. That's a good day to have a birthday! (I should know!) What a precious baby! congrats! Oh those cheeks!!!! She is adorable, and I'm so happy for you. Congratulations! oooh! congrats! I just wanna pinch those cheeks. what a cutie! You go MOMMA! With that delivery you've probably already lost all your baby weight…..LOL! 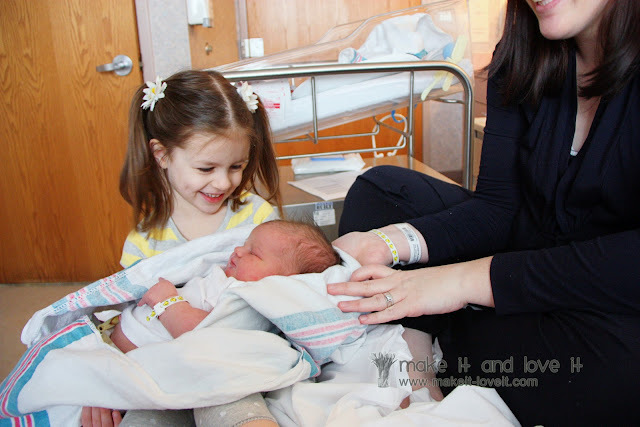 She is adorable :) Loving the non-crafty posts, esp when it includes newborn photos!! I'm glad you had a good delivery- that's really wonderful! She is so beautiful and chubby and delicious!! Congratulations! 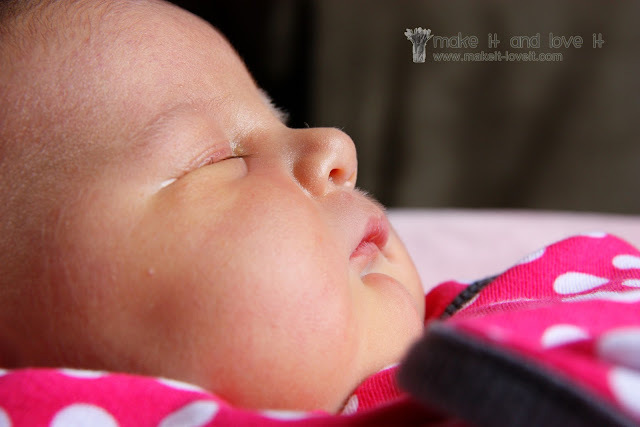 She is beautiful – and those cheeks!! LOVE THEM! Enjoy! Look at those cheeks!! 11 lbs, that's a whole lot of baby to love:) Congratulations momma you did good.